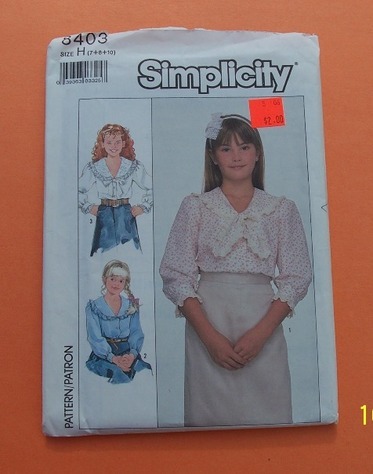 Simplicity 8403. Girls' Blouse: Blouse with front button closing has collar and sleeves gathered to buttoned cuffs. Eyelet trimmed V.1 has collar with front ends slipped through self loop and 3/4 length sleeves. V. 2 and 3 have long sleeves. V.2 collar has self ruffles. Lace trimmed V.3 has single layer collar and self bow.